BACKGROUND: Multimodal pain management is an integral part of enhanced recovery pathways. The most effective pain management strategies have not been determined. OBJECTIVE: The purpose of this study was to compare liposomal bupivacaine transversus abdominis plane block with epidural analgesia in patients undergoing colorectal surgery. DESIGN: This is a single-institution, open-label randomized (1:1) trial. SETTING: This study compared liposomal bupivacaine transversus abdominis plane block with epidural analgesia in patients undergoing elective open and minimally invasive colorectal surgery in an enhanced recovery pathway. PATIENTS: Two hundred were enrolled. Following randomization, allocation, and follow-up, there were 92 patients with transversus abdominis plane block and 87 patients with epidural analgesia available for analysis. INTERVENTIONS: The interventions comprised liposomal bupivacaine transversus abdominis plane block versus epidural analgesia. MAIN OUTCOME MEASURES: The primary outcomes measured were numeric pain scores and the overall benefit of analgesia scores. RESULTS: There were no significant differences in the Numeric Pain Scale and Overall Benefit of Analgesia Score between groups. Time trend analysis revealed that patients with transversus abdominis plane block had higher numeric pain scores on the day of surgery, but that the relationship was reversed later in the postoperative period. Opioid use was significantly less in the transversus abdominis plane block group (206.84 mg vs 98.29 mg, p < 0.001). There were no significant differences in time to GI recovery, hospital length of stay, and postoperative complications. Cost was considerably more for the epidural analgesia group. LIMITATIONS: This study was conducted at a single institution. CONCLUSIONS: This randomized trial shows that perioperative pain management with liposomal bupivacaine transversus abdominis plane block is as effective as epidural analgesia and is associated with less opioid use and less cost. 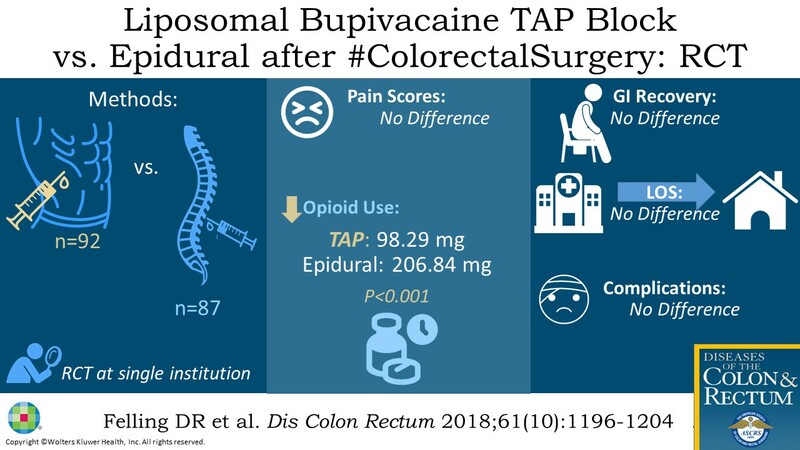 These data and the more favorable risk profile suggest that liposomal bupivacaine transversus abdominis plane block is a viable multimodal perioperative pain management option for this patient population in an established enhanced recovery pathway. Clinical Trial Registration: http://www.clinicaltrials.gov (NCT02591407). See Video Abstract at http://links.lww.com/DCR/A737. Financial Disclosure: Dr Cleary has received honoraria from Intuitive Surgical, Inc. for educational speaking. The remaining authors have no conflicts of interest to disclose. Diseases of the Colon & Rectum61(10):1196-1204, October 2018. Articles in PubMed by Daniel R. Felling, M.D., M.S. Articles in Google Scholar by Daniel R. Felling, M.D., M.S. Other articles in this journal by Daniel R. Felling, M.D., M.S.